A whole bottle of wine fits into these reusable, BPA-free flasks, which collapse into pocket-size when you’re done with them. 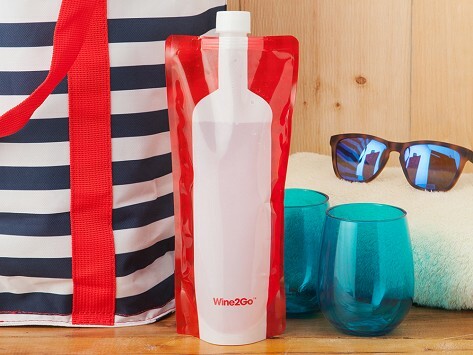 The flexible, durable, rollable containers have zero taste transfer and are great to bring your wine with you wherever you're going. Dimensions: 11" x 4" x 1.25"
Love my new Wine2Go! Its so handy.. I just put bottle of wine in it and off I go. Don't have to worry about it turning over or breaking! seems durable, packs flat... great for the beach, picnics, festivals! Very handy for travel, when you want to bring wine, but don't want the heavy bottles in your luggage!